When I was a kid, I was never suppose to put anything that glows into my mouth. 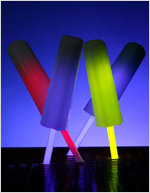 Times are a changing, Lick’Em Lights, the patented glowing popsicle from Poppin’ Glows, Inc., is now available nationwide through local participating 7-Eleven stores. It has been featured on “The Food Network” and in USA Today. So you probably are wondering how they make the popsicles glow… Well, the handle of each ice pop is hollow and a traditional Glo Stick is activated and pushed inside the handle. “The ice captures the glow in an eerie, iridescent light that surrounds the popsicle with a halo of light.” And now we have it… an edible, glowing popsicle.